I'm usually a less is more kind of girl but I do like having a small collection of certain types of accessories like scarves, mittens and sunglasses. I wear sunglasses pretty much every day I'm out both for sun and anti-aging protection. It's nice to have a few different pairs to coordinate with different types of outfits and degrees of sun intensity. My current collection consist of six pairs of sunglasses. I probably reach for the Ray Ban Jackie Ohh's since their classic styling goes with practically anything and the polarized lenses offer the best protection. The Marc by Marc Jacobs pair also gets alot of wear because I love how the blush color frames look with neutral outfits. Though I usually prefer oversized frames, the Classic Specs cat eye frames are part of my regular rotation. I find I tend to favor the frameless Coach ones the most when I'nm on vacation. Now tell me about your favorite sunglasses! I like the variation in your collection! Such a nice collection! I like the Marc by Marc Jacobs best. I currently only own 3 pairs. Wow, you have some awesome sunglasses! I would love a pair of Jackie Ohh's, so classic and sleek! Such a great collection Rowena, I love them all! I love sunglasses and have plenty but I do try to clean out my drawer and get rid of the ones that are scratch of a shown damage less is always more doll. Your collection rocks. I have quite a few and wear them depending on my mood and outfit. My most worn accessory. I have only one pair that I wear every day. They're closet in style to the pair you have labeled classic. Your Marc Jacobs pair is fun!! totally jealous of your collection. i am just a ray bans wayfayers kinda girl! i need to up my game. That's a great collection, Rowena! Mine are usually aviator and my favourite is one from Ralph Lauren. I really like your Marc Jacobs sunglasses, very chic! I think I remember seeing you wearing the Calassic Specs sunglasses on a photo. Wow, you have a rich collection of sunglasses, Rowena! I like the black Ray Ban, as well as the Marc Jacobs pair. The colour is really nice. I own only 1 pair of sunglasses, and they are scratched. I need to buy a new one for the upcoming spring/summer. What a nice collection. My favorite is a pair from Nina Ricci. It frames my face well without being overwhelming and so comfortable. I've been looking for another pair just like it because mine is ten years old, and it's starting to show some wear. I love your collection, Rowena. I always wanted the Jackie Ohh's one. Happy hump day, doll. I don't have much of one b/c I always end up breaking them or losing them. I bought a new pair at The Gap the other day. Your collection looks great though! 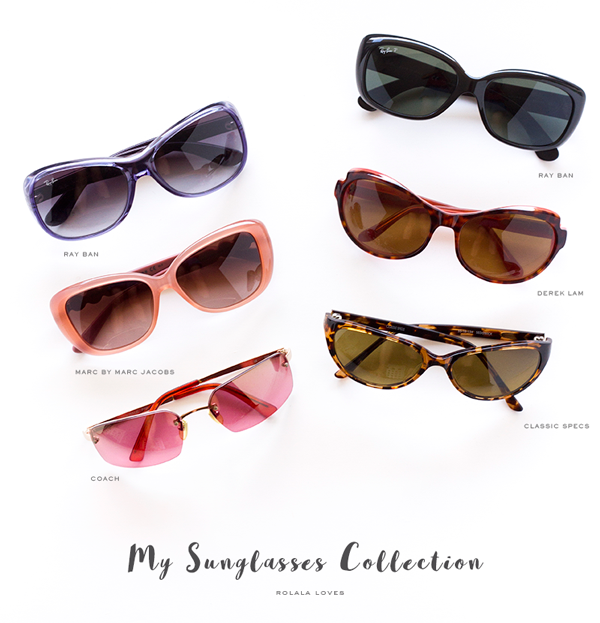 A really lovely collection Rowena, particularly the classic Ray-Ban designs. I like the peach colour of the Marc Jacobs shades too! You really do have a proper collection Rowena of sunglasses. I believe I've only about 4 pairs of sunglasses, lol. But, since I wear regular prescription eye-wear frames I have more of those 9 or 10 eyeglasses. My favourite sunglasses are probably my black Kate Spades, and surprisingly a mirrored pair I bought at Forever 21. I like the Classic Specs and Marc by Marc Jacobs styles above. I usually buy my sunnies at DM ( a German store chain). Their sunnies are affortable but also of decent quality. I don't like spending too much on sunglasses because I always worry I will lost track of them or misplace them somewhere ...and then I would feel bad. I do believe sunglasses are a great protection from the sun. I'm terrible at applying sunscream, I often forget it...and I don't use any anti-age product. So, I attribute the fact there aren't any visible lines around my eyes (well, at least I didn't see any and I see lines on my forehead so it is not like there aren't any) to wearing sunglasses often. We do get a lot of sunny days here and all my life I have been exposing myself to the sun a lot...but I often wore sunglasses and I think it made a difference (at least in the eye area). This is such a beautiful collection of sunglasses! I'm loving the colorful ones! oh gosh, i totally need sunglasses!!! 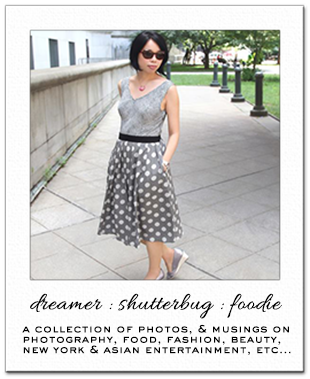 Illesteva, Celine, Gentle Monster and Karen Walker. I love your collection! My favorites are the black Ray Bans and the Classic Specs. Leopard print is always so fun!